In the last 10 years, we've seen a grand emergence of exciting new bands playing psychedelic music of many varieties, a phenomenon that is truly global. In America, this reprise has displaced a gigantic black hole that had been in place since the early 1970's. So for those of us perennially-detached fans lying in wait for such an event to occur, this has marked a true golden age. Just the geographical connection to some of these bands as well as fantastic events like the Strange Daze festivals has been a godsend. It follows then that I could not resist the short journey from central Ohio north to Michigan to rendezvous with one of the best discoveries of the 90's - Detroit's Walk on Water. My journey took me to the college town of East Lansing, where luckily I had a friend in whose apartment I could crash that October night. Walk on Water was to perform at Mac's, a small campus area bar over towards the center of town. Strolling in around 9ish with a couple copies of previous issues of AI to pass along, I was quickly accosted by several members of the band as they had recognized the items I was carrying (unbeknownst to me, Jerry had already sent them a copy of AI#4 with my review of their latest CD). Following introductions and exchanging compliments, I was then presented with a few items, including their 1996 CD High-Fi, a stylish WoW t-shirt, stickers, and a complementary beverage. Later, as the opening band began to drown out our conversation with tired Nirvana-style grunge, we zipped out to the band's travelling van for some relief. My generous hosts were insistent upon playing some of their favorites for me, both old (Pretty Things) and new (Queens of the Stone Age)...these are my kind of people! Eventually, it was time to return to the club, where Walk on Water proceeded to crank through a 50-minute set of heavy, psychedelic rockers to an appreciative audience. A majority of the tunes were culled from their recent supurb CD-EP Solvent Based Melodies, though they also treated us to their brand new single, "Particle Explosion," and an extended version of "Life" from High-Fi. The latter has since become one of my favorite WoW tunes, a delectable cosmic groove garnished with light ethereal guitar bits from Billy Reedy, and the occasional sonic blast. Apparently, the set length was predetermined by the establishment, and the guys in the band noted that this limit is common in Detroit and other cities they frequent. A bit of a bummer, though they managed to fit two hours of energy into less than an hour of stage time. The finale of the performance was (fittingly) their rendition of the Who's "Armenia," complete with the destructive antics at the song's conclusion, with Eric Miller kicking apart his drum kit, and Mark Kahaian (also the band's vocalist/lyricist) jamming his Gibson SG into the amps. Well, that last part was only imitated...you see, the guitar actually belonged to bassist Jim Anders, and he wasn't about to let Mark damage his prized possession. After the abbreviated 'take no prisoners' performance, the band and their entourage (as it were) retreated to a nearby dwelling that serves as home to a fellow indie, Etch Magazine. I tagged along at the band's suggestion, and there we relaxed, chatted about music (naturally), and watched an outrageous video of old glam-rockers from many days gone by (Marc Bolan, Gary Glitter, Slade, etc.). Amazing stuff. By the time we had all finished our late-night 'breakfast' at a local 24-hr restaurant, I finally made my way back to my friend's apartment at 4 AM. I'm too old for that sort of thing anymore. Still, I had a great time and look forward to my next encounter with the lads from Motown. Luckily, I shouldn't have to wait too long, as they're planning to do a show in Columbus in the next month or two. 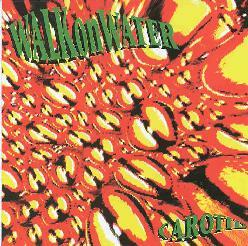 Walk on Water's recording career began with the 1993 CD-EP Carotid (Rust Belt RB-CD001). At just over 20 minutes, Walk On Water showed early on that they excel in the 'short and sweet' mode - you know, get in - do your business - get out; veni, vidi, vici. You get the picture. The benefits of brevity are lost on many space-rockers and especially proggers. However, Motorhead's Lemmy proved long ago in the rapid-fire world of three-chord speed metal that you can satiate an audience's appetite in under an hour. On that October night, Walk On Water wasn't quite able to accomplish that (I was certain they hadn't yet run out of great songs), but then there's worse things than to leave 'em wanting more. That's also the way I felt about Solvent Based Melodies, the 1998 EP that I will continually rave on about for several more issues, if given the chance. Whereas Carotid stuck more closely to the band's roots in classic rock, with just a touch of edginess, High-Fi (Rust Belt RB-CD008) gave the band room to stretch out a bit more and explore other avenues. The opener, "Solar Power Ride," was the first of the classic high-octane psych rockers that WoW has since continued to produce (with SBM's "The Vortex Inside" and now "Particle Explosion"). These tunes have all the sound and energy that the best 'stoner rock' bands (Monster Magnet, Fu Manchu) can muster, but yet have actual instrument separation and clarity in the vocals! None of that hiding in the murk (though I doubt they'll develop the sound clarity of Yes anytime soon). For me, that makes all the difference in the world...I can have my psychedelia, and eat it too! Given Walk on Water's propensity for making quick work of things, High-Fi is naturally a bit uneven, with a couple seemingly-misguided psychobilly tunes working their way into the mix. But winners like "Transitor" with its 'cosmic conquistadores' sound (a la Kingston Wall's "Another Piece of Cake") and a rousing cover of Echo & the Bunnymen's "Villiers Terrace" make the disc an essential item. Over the last several years, it's apparent that the music of Walk on Water has become increasingly entreched in psychedelic flavorings, and I imagine that this trend will continue into the next millenium. It's the part of the band's voice that gives them a truly unique character. On that note, let's move on to the interview portion. I'll let them tell their story in their own words, which is easier on me anyway. The four were nice enough to take the time to answer some questions I had prepared in advance of my trip north. Here are their responses. AI: So how did Walk on Water get started? Had you all been in other bands in the Detroit area previous to the formation of Walk On Water? Jim Anders (JA): Our eyes met, our strings met, our rhythm met and you all know how the smooth tunes go. There really is no exotic storyline here. We all stumbled across one another and fit like 'puzzled' pieces. Mark Kahaian (MK): Both of our previous bands called it quits around the same time. Our common producer, Al Sutton, strongly suggested we meet each other and run up an electricity bill. Myself and Billy were in Happy Death Men, and James and Eric were in Tangent Image. AI: What groups or artists do you consider to be your main influences? Billy Reedy (BR): My main influences are more real life than in anything...energy and true living people, as opposed to bands and music. But if I have to go to musical influences, you don't have enough ink to print them. Everything I've ever heard I've been influenced by, good or bad. Eric Miller (EM): All roads lead to classic rock - Hendrix, The Doors, Zeppelin, The Who, The Beatles, and Cream. There is so much to learn from these bands. Also, the MC5 and The Stooges have had a big impact. Being from Detroit, it may seem clich to say 'Motown,' but this is the music I listened to when I was younger and it is still in my disc player all the time. JA: My influences are extremely widespread. They range from Elvis Presley, James Brown, and the Beatles to Led Zeppelin, Stevie Wonder, Hank Williams, The Who, and of course such local acts as the MC5 and Iggy & the Stooges. The aforementioned have had a huge impact on my approach to writing and performing. Instrumentally speaking, Jack Bruce, Paul McCartney, and John Paul Jones are major influences on my bass skills. MA: For me, The Pretty Things, Pink Cream (sic), Zeppelin. AI: Of course, as you mention, Detroit was the home of some early pioneers in psych music (like the MC5, Amboy Dukes, etc.). Do you feel that you're continuing that legacy? EM: That's awfully powerful to live up to and I don't really see it that way. We get the comparison an awful lot, which is nice, but we aren't out saying, "Hey, look at us! We're the second coming!" JA: I think anytime you come from Detroit and play loud, aggressive-style music, you are going to be compared to those bands. Being big fans of theirs, coming from the same blue-collar environment, there is a definite connection. As far as a legacy is concerned, I guess we'll know in about 20 years. MK: I personally collect the crumbs dropped by my psych idols from overseas. AI: I've heard about this new 'spacerock' scene going on in Detroit, but mainly I see names mentioned like F�xa, Asha Vida, and Windy & Carl. [I've since checked some of this stuff out...see reviews.] But I gather they are more into the neo-krautrocky synth-music a la Stereolab. 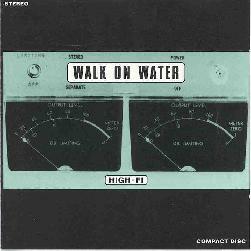 Walk on Water sounds more like what I know as 'classic' spacerock, the guitar-driven cosmic jamming in the Hawkwind style. Do you see any parallels between these two different approaches, and do you have any contact or relationships with these other Detroit artists? JA: To be honest, I have heard of those bands and some of their music but I don't know too much more about them. I see no parallel with their music other than the possibility they use some of the same effects. I would consider Walk on Water closer to Classic Rock than those other bands. EM: Personally, I've never heard them, so it's hard to say. What I can tell you is that Walk on Water is into experimentation of all types, but ultimately it's all about rock. MK: Our approach is not necessarily 'trend-related.' Yes, there is a category of indie space bands who I enjoy seeing live. There does seem to be a boundary between what we do and what they do. We dig the Cream and MC5. They dig Stereolab and the Beach Boys. We have large British amps and Sparkle 60's drums. They have combo amps on folding chairs and have *a* drum (usually a cute girl). We eat steak, they are vegan. I personally appreciate and befriend bands like Godzuki, Teach Me Tiger, Outrageous Cherry. BR: In Detroit, there is a strange thing - no support from people, fans, what have you, but more support for some are from out of town, which makes sense. You're never welcome in your home town. But the other space rock is 'real out.' I think there is a strange connection between each of us. AI: I know you have a close relationship with Bob Ebeling of Ebeling-Hughes, as he co-produced your most recent CD-EP (Solvent-based Melodies). But EH music is more along the lines of textural experimentation rather than up-tempo psychedelic rock, so I'm wondering what sort of ideas he brought to the table when you first went into the studio to record the album. JA: Bob offered far too many ideas to pinpoint. Among them include: recording techniques, some changes involving arrangements, a dash of piano, and vocals here and there. But I'm sure I am forgetting something. MK: I met Bob by chance standing next to him at a show. We started talking music and the first band that I mentioned to him was Ebeling Hughes (I wasn't aware at the time it was him.) We spent a lot of time recording drunken music together which we released on a single (as 'Baker'). I love the element of fun and experimentation that we shared, so I thought it would be great to bring him around my 'career band' to see what tricks he may have up his sleeve, which proved to be wonderful. BR: The Ebeling session was one of the smoothest and easiest I've ever done. Bob was fantastic to work with and really added another atmosphere to our music. EM: I think Ebeling Hughes are some remarkable musicians, and any time you can work with someone of that caliber, you do it! Bob used ideas for tones and recording methods we may not have tried. His approach to recording and producing is very experimental, yet well thought-out and executed. AI: So what plans do you have for the upcoming year, as far as new material, touring goes? Are you planning to stay with the self-produced indie-release mode, or do you have intentions on signing on with an established label? EM: We have hooked up with a booking agent in Chicago, and are looking forward to doing more touring next year. As for labels...Ha!! (Oh, sorry, don't print that.) [Too late! - ed.] So much talk, so little action. We will continue to write and record the music we enjoy and if a label wants to get involved on a level that's more than tax-related, that would be nice. JA: We would love to be on an established label. MK: But we'll know if the label is right for Walk on Water by sense of 'genuine' interest. In the meantime, we're just touring as much as possible. AI: What sort of live shows do you do...I mean, do you normally have a full light show and/or slides against a back-drop, or does it vary? EM: Live shows are something Walk on Water has always thrived upon. We try to incorporate a type of psychedelic atmosphere that goes with our music - disco balls, video clips, liquid backgrounds, that kind of thing. We love trying different things and seeing what comes out. JA: We do it all, baby! Seriously though, depending upon the venue, we try to entice our audience as much as possible through our psychedelic visuals, which include science-fiction slide-show documentaries. AI: Finally, do you have any anecdotes to tell that sort of sum up the experience of being in a space-rock/psych band? JA: Best anecdote ever...the Detroit music scene! EM: A whirling, swirling mass of sound delivered on 10. MK: Music only really matters to me when we are trapped into the moment - pure escape, not wondering about life's demands....jamming into a new galaxy. BR: Being in this band is strange, because we don't always agree on things, but we've become such a family, it's OK. When we're on stage, no one can touch us. There is a great boundary that only the four of us know about.